Question came in last week about a play and whether it is a violation or not. Mearl Challender found something in a previous Sportorial which documented the play. Here is the play and the ruling. Play: After receiving a pass A1 attempts a pass to A2. Right after A1 releases the ball, A2 , who is unaware a pass is coming runs towards the basket. A1 runs to where the ball has bounced off the floor but before any other player touches the ball , A1 (a) grabs the ball and holds it, or (b) pushes the ball toward the floor and dribbles it. Has a violation occurred?? Ruling: No violation has occurred in either scenario. In order for a pass to occur, the thrown ball must be touched by another player thus the throw was not a pass. Since the ball struck the floor, A1’s throw is considered the start of the dribble. In (a) A1 ended the dribble by grabbing the ball. A1 may not begin another dribble without violating. In (b) A1 simply continued the dribble that was already started and may continue to dribble. Question came in last week, “Is a ball passing behind the backboard out of bounds?”. Good question and it’s a play we hardly see. A player touches it while who is out of bounds. It touches any person, the floor, or an object outside of the boundary, like an official. It touches the ceiling or overhead equipment. When it passes over the backboard. So, if a ball passes behind the backboard (examples - thrown or tapped), it is NOT out of bounds unless it makes contact with the support or the backboard itself. What’s the penalty for a Technical Foul? Easy right? 2 Shots and the ball! Let’s go over a couple of situations to make sure we are clear. B1 commits a common foul and then B1 is charged with a Technical Foul as the official walks to the reporting area. The common foul is Team B’s 6th and the Technical Foul is the teams 7th as Technical Fouls count against the team total. So the question is, do we shoot a 1-1 as well as the 2 for the T since it’s the team’s 7th and how do we handle putting the ball back in play? The answer is it’s just 2 shots and the ball (half court) as we do not penalize Team B for the 7th Bonus foul if it’s because of the Technical. B2 commits a common foul against A1 and then B2 is charged with a Technical Foul as the official walks to the reporting area. The common foul is Team B’s 9th and the Technical Foul is the teams 10th as Technical Fouls count against the team total. In this situation, we penalize in the order of occurrence. A1 will shoot a 1-1 with no one lined up, then Team A will shoot 2 shots for the Technical and get the ball (half court). We do not penalize Team B for the 10th team foul in this situation. Let's talk about a "BLARGE"
What is a "BLARGE"? It's when one official has a Charge and another official has a Block on the SAME contact between an offensive player and a defensive player simultaneously. Hence the term, "BLARGE". What is it really??? IT'S A DOUBLE FOUL!!!! How do we officiate this play? It’s a Double Foul and should be processed as such. It is incorrect to allow one official's call to override another's. How do we avoid a "Blarge"? The Center and Trail officials should hold their preliminary signals. Center or Trail should whistle to stop the clock with a raised fist to communicate that you have a foul, but do not add the block or charge signal, hesitating to make sure the Lead has come up with a call. Eye contact should be made between the Lead and the outside calling official immediately. This sequence should be reviewed in your pre-game meeting so that all officials are prepared for the situation and how to administer. Player Control on A1 and a Blocking Foul B1 - By rule in any double foul, both A1 and B1 are both charged with personal fouls. The ball is put back into play at the POI and would be given back to A at the spot nearest to where the foul was called. Player Control on airborne passer A2 who makes contact with defender B2 – A is in Team Control when the double foul was whistled. Team A would retain possession as they were in Team Control. Under the POI, the ball would be put in play at the closest spot to where the foul occurred. After release of the ball on a shot attempt a "Blarge" occurs - No Team Control after release. With no Team Control, if A1’s field goal attempt is good, count the basket and the POI would entitle Team B to a throw in and may run end line. After release of the ball on a shot by that a "Blarge" occurs and the attempt is no good – Since there is no Team Control, administration of this double foul would call for the Alternating Possession Arrow, as the POI, at the nearest spot to where the foul occurred. KEY POINTS - Have a thorough pregame. Outside officials hold preliminary signals. Communicate. The assigned REFEREE is responsible for having EACH TEAM NOTIFIED 3 MINUTES PRIOR TO the start of the SECOND EACH HALF. Notify the Site Administrator BEFORE you go into the locker room for half time to notify BOTH teams when there is 3 minutes left to the start of the third quarter. If the teams are on the court and ready to go when you get back out onto the court, then there is no issue. But if either team is in the locker room and it’s approaching 3 minutes - you should locate a site administrator to get a message to the team(s). This is not a "courtesy" but rather a specific duty outlined in the rule book. A common responsibility that (arguably) is missed by many experienced officials relates to the foul calling sequence. When a foul occurs the official shall SIGNAL the TIMER to STOP THE CLOCK with a closed fist. That's the easy one we all get. The part many of us forget is the requirement to VERBALLY INFORM the OFFENDER. This should all occur near the spot of the foul after stopping the clock properly. What we see (much of the time) is the stop clock signal followed by the calling official moving toward the table to report the foul to the scorer. While this is appropriate for the final piece of the foul calling sequence - there should be a communication to the offender at the spot BEFORE you go to the reporting areas. Indicating the COLOR and NUMBER of the offender along with the appropriate preliminary signal will not only satisfy this requirement but alerts your crew to your ruling and embeds in your mind the proper player this foul should be assessed to. After three quarters if a team is leading by 35 or more points the clock shall run (except during timeouts) for the duration of the fourth quarter. The clock shall continue to run even if the differential falls below 35 points. Coaches are asked discretion in using varsity players during this quarter. This is not the Officials concern. Officials, we are now full swing into the season. Let’s take care of ourselves so that our season will be a healthy one. Sell the basket good or no good at the end of the quarters. All fans eyes are on the officials if the ball goes in. Make sure they can easily see who the calling official is. Remember, the calling official is across from the table in 3 Person but may be table side in 2, so as the ball is in flight, make your way towards the table and be demonstrative. If the shot is no good, there is no reason to watch the ball to see if it goes in. Hit your whistle to bring the attention to you, focus on the table as you make your way towards it, and waive it off emphatically. Make sure you go to the Reporting Area (P. 55 in Manual). Often times, in 3 Person, I see the official who makes a foul call across from the table, to go to the reporting area. Remember, many times the official scorer is a student who is volunteering his or her time. By helping them out, you may be helping yourself out later in the game. All Officials are required to be on the court at the 15 minute mark prior to the game. Make yourself aware of the time on the clock. Also, we are getting out of the locker room after the half late as well. Keep track of the time. Signals > I’ve seen Pushes called Blocks and I’ve seen Blocks called Pushes. I’ve even seen Blocks called on the floor and Pushes called when the Officials reports the foul to the Scorer and visa versa. We know which is which, let’s take our time when signaling. Remember, our mechanics help us sell our calls. I hear Officials say, “On the floor”, trying to convey that there is no shot and it will be a spot throw and not a shooting foul. Let’s remember that a player can be on the floor and begun his/her shooting motion which will be a shooting foul. Once a player picks the ball up to begin a shot, he/she has begun their shooting motion and should be called in that manner. That can happen before a player takes flight. Be sure to get out on the court 15 minutes prior to the game to observe the teams. It’s a good time to make sure the teams are properly outfitted. 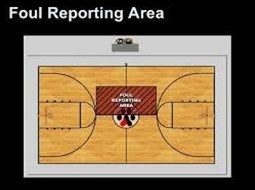 In 3 Person, be sure, when making a foul call opposite the table, you go to the reporting area to communicate with the scorekeeper. Often times, the scorekeeper is a student with little experience, if they are not sure of the number, they may guess and it will only cause problems later in the game. In 2 and 3 Person games, the Trail needs to step down on a shot and get a better angle. It will also allow you to be closer to play, so if you have something, it will help us make our calls, among other things, more believable. Each day, I go through the sport pages in the local papers and online and I see some great shots of players doing some special things. But sometimes I notice that the player in the photo is not properly outfit according to rules 3-5-3, 3-5-4, and 3-5-7. It’s important that we are all on the same page and enforce these rules right from the beginning of the season. Rule 3-5-3 – Arm sleeves, lower leg sleeves and tights are permissible. There are color restrictions and all must be the same solid color for all participants. Rule 3-5-4 – Headbands and wristbands have color restrictions and all shall be the same color for each item and all participants. Rule 3-5-7 - Compression shorts shall be a single solid color similar to the predominant color of the unifirm; the length shall be above the knee. Undergaments shall not extend below the pants/skirt. Have a Happy Holiday and a Happy and Healthy New Year! Jump Ball - When the ball is released by the tossing official. Throw-in - When the ball is at the disposal of a/the thrower-in. Free Throw - When the ball is at the disposal of the free thrower. Caught by a thrower/player after it is bounced to her/him. Placed on the floor by an official. Available to a thrower/player. After a goal, the ball is there (near the end line and available/playable by a player on the offensive team - the ball is live and the official shall begin the 5-second throw-in count. The official bounces the ball and it is caught by the free thrower. The ball is placed on the floor, at the free throw line. *When the ball is bounced to a throw-in or free thrower the ball does not become live until the player catches the ball. *Time-out requests by the defense may not be granted once the ball becomes live. A free throw, which is to be followed by another free throw or throw-in, is not successful. The ball becomes lodged between the backboard and the basket’s ring. The ball comes to rest on the basket’s flange. A player control or team control foul occurs. An official’s whistle is sounded. Exception - Ball does not become dead while a try or tap for field goal or a try for free throw is in flight or until the airborne shooter returns to the floor. A foul, other than player or team control, occurs. Exception - Continuous motion, provided the time did not expire prior to the release of the ball. A free-throw violation by the throwing team occurs. A violation (rule 9.2 thru 9.13) occurs. Exception - When a player leaving the court for an unauthorized reason or a player excessively swinging arm(s)/elbow(s) is an opponent. I have had many questions regarding Team Control. When a player has the ball in his possession. When a live ball is being passed among teammates. When a player has the ball at his/her disposal for a throw-in. The ball is in flight for a tap or try for goal. A Coach asked to meet with me after the game to talk about a call or two, when is it a good idea to meet with him right after? ANSWER – NEVER! Emotions are high on the Coaches part and perhaps on the Officials as well. This is not the recipe for a successful situation. There is not an official in the land who can make this a win-win situation. If you think you are the exception, you are fooling yourself. Does the LEAD raise his/her hands to signify a 3 point shot is successful? ANSWER – On a 3 point attempt, the COVERING (PCA) official will signal by extending one arm at head level with 3 fingers extended. If the attempt is successful, the official will raise both arms straight up. When the LEAD official signals a successful 3 point goal, the TRAIL will mirror that signal. LEAD DOES NOT mirror the signal of the TRAIL. Can a player wear long sleeves? ANSWER - YES. Undershirts shall be a SINGLE solid color SIMILAR to the torso of the jersey and shall be hemmed and not have frayed or ragged edges. If the undershirt has sleeves, they must be the same length. When does the clock start at the beginning of the game? ANSWER – On a jump ball, the clock IS started when a tossed ball is legally TOUCHED by a jumper (Rule 5.9.2). Not when it leaves the Officials hands. The ball is live when it leaves the Officials hands (Rule 6.1.2a), but the clock does not begin at that time. Where do I put the ball in play on a foul off of the ball? ANSWER – After a player control foul, a team control foul, or a common foul prior to the bonus, the designated out of bounds spot throw is NEAREST to the FOUL. NOT where the ball is. How big is the Coaches Box? Following a player releasing the ball for a shot and before the ball hits the rim, there is a foul committed by his/her team, does the other team shoot free throws if they are in the bonus? ANSWER – YES. Team Control ended when the ball was in flight for a try for goal. A player on offense (Team A) is passing the ball to a teammate and the ball is deflected by the defense (Team B). As a player from each team is going for the ball, the player from Team A pushes the player from Team B and a foul is called. Team B is in the bonus, should they shoot free throws? ANSWER – NO. Team A still has Team Control. As we work 3 person, this play is a possibility. Know the ruling! A1 drives to the basket and releases the ball. Contact occurs between A1 and B1 after the release by the airborne shooter. One official rules a Blocking Foul on B1 and the other rules a Charging Foul on A1. The ball goes IN the basket. RULING: Even though the airborne shooter committed a charging foul, it is not a player-control foul because the two fouls result in a DOUBLE FOUL. And the Double Foul does not cause the ball to become dead. The goal is scored; play is resumed POI, which is a throw-in for Team B anywhere on the end line. The following questions were the most missed on the Cadet Test. The answer and the rule reference follow each. REMEMBER – Be proactive regarding the Coaches Box! If you do not see it applied, talk to the Site Supervisor when you walk into the gym, before you walk into the locker room, when you walk out of the locker room, when the books is reviewed, after you meet with the Captains, and after warm-ups. It is in everyone’s best interest that there is one to begin the game. As per NJSIAA’s advice, under no circumstances should Officials put down a box for liability reasons. Middle School games are NOT NJSIAA sanctioned. The Coaches Box rule is not applicable in these games. Also, since the initial Interpretation Meeting, note that the NJSIAA is no longer asking that there be a pre-game hand shake between the teams. The NJSIAA has said they will be sending out to each school a message that if the Coaches Box is not on the floor prior to the game, both coaches must sit the entire contest. I am unsure if it will include sub varsity. The point the NJSIAA is making is that it is the schools responsibility to assure the Coach’s Box is down. When you enter the gym. Before you enter the locker room to prepare for the game. As you leave the locker room to assume your responsibilities on the playing court. At the 10 minute mark when the scorebook is reviewed and approved. I do not encourage you to deal with the Head Coach on this issue. They have already begun their coaching even though the game has not begun. Any interaction on this issue could have a negative impact at some point during or after the contest. Finally, at some point, place the Coach’s Box down yourself using athletic tape as you have always been instructed to do. Even though this is not our responsibility, it may go a long way in making sure you have a successful night on the hardwood. If you have any questions or comments, please email me at chrischianese@gmail.com. A couple of situations came up in the past couple of weeks. Here are my comments on them. If a coach is ejected from a game for a single Flagrant Foul, a second Direct Technical Foul, or a third Technical, where do they go? As stated in rule 10.5 Penalty Note, "ejected adult bench personnel shall leave the vicinity (out of sight and sound) of the playing area". If the team has no one to take over and coach/supervise the team, they are permitted to sit behind the bench. If a player is ejected from a game, where do they go? They are confined to the bench area and are under the supervision of the Head Coach as pr the NJSIAA handbook. Player is now part of bench personnel. Any further penalties against this player should be handled knowing this. Officials should ALWAYS get together on Technical Fouls. Are glasses permitted? Yes, of course. They do not have to be "Rec Specs" either. If for some reason the official thinks that the glasses are dangerous, then a discussion should occur. But from my experience, I have never seen a pair of bifocals with spikes on the end of them. Use common sense please. Double Foul - Do we go to the arrow or point of interruption? Point of Interruption. Know the rule. Here's one that comes up once or so a season… A coach comes over to you in the Varsity game and says a player has played too many quarters that day. And some coaches ask for a Technical Foul to be issued. How should we handle this? Have it noted in the book and ask them to speak with their Administrator following the game to a follow up. We issue no penalty no matter if the Coach is correct or not. The schools and the NJSIAA will handle any penalties if found in violation. We spoke about the proper uniform at one of the meetings. The only approved patches for this regular season is the IAABO, NJSIAA, and flag on our uniforms. If you are wearing something else or if not all of these, you could be fined $10. The backcourt of a team consists of that part of the court between its endline and the farther edge of the division line, including the entire division line and the opponent's basket and the inbounds part of the opponent's backboard. The frontcourt of a team consists of that part of the court between its endline and the nearer edge of the division line, including its backboard and the inbounds part of the backboard. Throw-in and Nearest Spot…Accuracy is vital in identifying/indicating the throw-in spot which follows a time-out; other delay; a foul; a violation - CARE as it MATTERS! Do you know where the nearest spot is? Take a look on page 41 of the IAABO rule book. This is how all of us should be interpreting the throw in spot. Also, if the ball goes out of bounds on the opposite side of the lane, walk over and administer there. If not, we look lazy! When you are on the court viewing the teams warm up, it is not the time to carry on conversations with our friends in the stands. We should be much more professional! It looks bad when we do it and it looks worse to those teams coming from out of town when they see us do this. We have a job to do during that time. Of course we count the players and make sure there is no dunking. But we should also be observing players arm bands, head bands, wrist bands, and any other equipment to see if it is compliant with our rules. Why not work on picking up players pivot foot as a point of reference for traveling? Let me know what you're doing during warm-ups. Maybe I can pass it along to help others. Coaches are asking that we PRINT our names in the book. Some are signing the book and the word is that our signature in not legible. Only the proper uniform is permitted. Reminder - it's a $10 fine if you are not wearing approved patches if reported. I asked for responses to what some of you do during pregame warm-ups. Rick Garzillo had a good one. When those out of town teams come in, Rick asked one of the players who is the Head Coach and what his name is. Good one! When we have a held ball, be sure to give ALL of your attention to the players until you are sure there will not be any extracurricular activity that requires our attention. This is part of good game management. The Possession Arrow will still be there when we are ready to see who gets the ball. Put the ball in play where is it supposed to be put in play. If it is supposed to be a sideline throw in, make sure it's a side line throw in. Make sure you point to the throw in spot after you make a call AND make sure the ball gets put into play there. Lastly, be meticulous! Coaches have sent in tapes regarding the smallest of items they feel have a great impact on the outcome of the game. Things like where the ball gets put into play and improper signals used. BE SURE TO STAND WHERE THE BALL IS GOING TO BE PUT IN PLAY DURING TIME OUTS. If the Officials are going to gather to go over game management, it MUST be where the ball is going ot be put in play as to not cause any confusion. INCORRECT NUMBERS IN BOOK: Only one team technical foul is charged regardless of the number of players and substitutes not wearing the number indicated in the scorebook. Each player must wear the number indicated in the scorebook or change the scorebook number to that which he is wearing. Any substitutes who become players and require changing of the number indicated for them in the scorebook will not result in a penalty as the one maximum technical foul has already been charged to the team for an administrative infraction. Administrative - Charged to the TEAM and COUNTS towards the Team-Foul count. Bench Personnel - An Indirect to the Head Coach, Player and his 5 fouls, it COUNTS toward the Team-Foul count. A DQ'd player on the bench - Charged as Bench Personnel (see above), COUNTS towards Team-Foul count, and Indirect to the Head Coach. Assistant Coach - charged to the Assistant Coach and it counts towards his/her 2 T's toward ejection, COUNTS toward Team-Foul count, AND is an Indirect to the Head Coach. Head Coach - Charged to the Head Coach as a Direct T, and COUNTS toward Team-Foul count. Does the Head Coach lose Coaching Box privileges for an Indirect Technical foul? YES! Last season we wore the "JM" patches in memorial of Joe McBride. For those of us who were lucky enough to have a closer relationship with Joe, we all know we were better for it. I couldn't even count the times Joe has crossed my mind in the locker room before the game thinking of conversations with him or remembering him walk around the locker room doing his pre-game rituals. I placed Joe's patch that I wore on my bag. There's not a day that I officiate that I don't think of him. Backcourt Violation - Rule 4-12-3c - Team Control continues until the ball becomes dead. In a play where Team A has a throw in (it can be anywhere on the court), and on the throw in by A1, it is deflected by A2 who is standing in the front court, it is NOT backcourt when A2 goes into the backcourt and gets it. Team A NEVER had established possession in the front court. On a FG try: Rule 4-12-3a - Team Control continues until the ball is in flight during a try or tap for goal. In a play where player A1 releases the ball for a shot, and following that, A2 fouls B2, it is NOT a team possession foul. So, if Team B is in the 1-1, they will shoot the 1-1. In a play where player A1 is in the act of shooting BUT has NOT released the ball for a shot, and A2 fouls B2, it IS a team possession foul. So, if Team B is in the 1-1, they will NOT shoot the 1-1. In a play where Team A has taken a shot, and there is a rebound and A2 fouls B2 before any team gains possesion, it is NOT a team possession foul. So, if Team B is in the 1-1, they will shoot the 1-1. ITS POST SEASON TIME! WE NEED TO BE OUR BEST! OFFICIATING - DID YOU KNOW? Coaching Box is 14 feet. 2-12-5; 10-5-3 The interval to replace a disqualified player or injured player, a player directed to leave the game is 20 seconds. A warning horn should be sounded with 15 seconds REMAINING in the interval (5 seconds into the interval. Rule 3 It is a maximum of one technical foul per team after he designated time period (10 minutes) has been reached, for adding a name(s) to the team member list, changing a team member or players number, having a player change to the number in the book, or a change in the starting lineup unless the change is necessitated by an illness or injury or to attempt a technical foul free throw. 3-3-4 Official stops play for an apparent injured player. If the player is not injured and wishes to remain in the game, and the official has not beckoned for assistance and no bench personnel have entered the court, the player may say in the game and play is resumed. 3-3-5, 3-3-6 If play is halted because of bleeding, and if a time out is then requested, if the player is ready to play at the end of the timeout, he may remain in the game. 3-5; 4-3, 4-4 The referee shall not permit any team member to wear equipment or apparel which in his or her judgment is dangerous or confusing to other players or is not appropriate. This INCLUDES pre game warm up. 4-4-6 The 10 second count continues until the ball and both feet of the dribbler are touching entirely in the front court as the ball then has front court location. 4-5-4 Both teams have gone the wrong direction to start the game. Even though considerable time has elapsed and points have been scored at each basket, nothing will be erased. The points will be scored as if the teams had gone the right direction. All fouls, violations, time consumed, etc., will stand and the game will resume from the point of interruption with both teams instructed to go the right way. 4-12-1, 6-4-7 If a jumper catches a tossed ball before it touches the floor or a non jumper, a violation is called. The opponents will be awarded a throw in and the arrow will be set toward the offending team. 4-44-3 When a player, after jumping from the floor, drops the ball to the floor to avoid having it blocked and then recovers or bounces the ball, it is a traveling violation. 5-2-5 The throw in is made with 3/10 of a second on the clock. The throw in pass is caught and he tries for a field goal. No goal can be scored on a try whether or not the ball is in flight on the try when time expires, in this situation a tap could score. 5-12-5, 1-13-3 Time outs should be conducted within the confines of the bench area. Players shall remain standing during a 30 second time out. 7 The privilege of running the end line following a goal or awarded goal remains after a time-out after a delay of game warning on the opponents and if a foul or violation, by the opponents occurs when the end-line privilege is in effect. 7-5-7 Goaltending occurs and a dead-ball player control foul is committed. Award two or three points for the goal-tending violation. Team that goal-tended will be allowed to run the end line. Rule 8 - Free Throw. If a free throw is awarded and the offended player is injured or disqualified, the substitute shall shoot the free throws. Technical-foul free throws may be attempted by any player, including an entering substitute of the offended team. Rule 8 Free Throw - During a free throw for a personal foul, other than intentional or flagrant, each of the marked lane spaces adjacent to the end line shall be occupied by one opponent of the free thrower unless the resumption-of-play procedure is in effect following a time out or intermission. A teammate of the free thrower is entitled to the next adjacent marked lane space on each side. 8-3 If a technical foul occurs before the game starts, a substitute may take the place of the designated starter to attempt the free throws. 9-1-9 If an opponent violates, followed by a teammate of the shooter in a marked lane space, the second violation is ignored. 9-2-3 It is a violation of the throw in team if a teammate touches the throw in pass while the ball is on the out of bounds side of the throw in boundary plane. 9-5 The player gains control after a fumble and dribbles. Player ends the dribble and then fumbles again. The player could recover the ball, but it is a violation if the player dibbles again. 9-8 Team control is not lost by the dribbler when the ball is batted by the opponent even though the dribble has ended. The count continues, and it becomes a violation when the count of 10 is reached. The count continues until the ball touches the floor, a player or an official, in the front court. 9-9-1 If a player leaps from the backcourt while the ball has already obtained frontcourt status and the player catches the ball in mid-air and lands in the frontcourt, this is a backcourt violation as the previous location of the player who caught the ball in the air was the backcourt. 9-9-1 During a throw in, a player passes the ball to a teammate in the frontcourt who muffs the ball and goes into the backcourt. It is not a backcourt violation since the team did not establish control in its frontcourt. There is no player or team control during a throw in. 9-9-3 When the ball is touched on a throw in by an opposing team, the throw in has legally ended. Since the throw in exception cannot apply, when the offensive player takes off from the frontcourt and lands in the backcourt, a backcourt violation has occurred. 10 The second technical charged to a player, team member or any bench personnel other than the head coach results in a disqualification. The third technical or second technical directly charged to the head coach results in disqualification. Fighting - Players on court: Numbers of participants are not corresponding - Flagrant fouls and disqualification for all participants, two free throws are awarded for the offended team for each additional player, offended team awarded throw in at division line. Bench personnel leaving bench area during a fight or when a fight may break out: IF they do not participate in the fight - all players leaving the bench are assessed flagrant technical fouls and disqualified, the head coach is assessed a maximum of one indirect technical foul (no matter how many leave). If the maximum number of each team's offenders is unequal, and maximum of two free throws are awarded the offended team. Fighting - All fouls count toward team's fouls except indirect charged to the head coach. 10-3-9; 9-2 Penalty 3 A player who reaches through the throw-in boundary plane and touches the ball commits a technical foul whether or not a throw-in plane warning had been given previously. This specific act is a player technical foul.